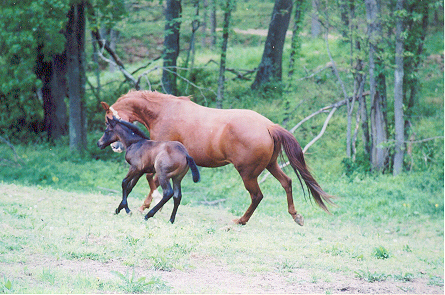 Welcome to Smokin Performance Horses.. take a LOOK AT OUR MARES. She is a granddaughter of Zippo Pine Bars, Great Granddaughter of Zippo Pat Bars, Oak Bar, Dry Doc, Alleybar. She is reg. 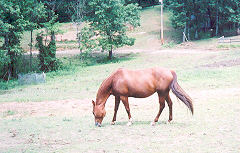 AQHA, FQHR - 87.5%. 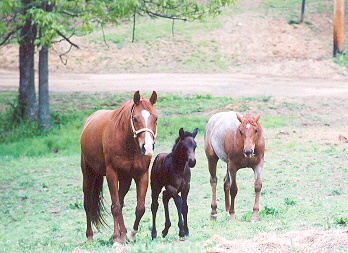 I love this picture of Holly and her family.. Boogity is her 2003 colt and the Red Roan is her 2002 filly..
She is a 1994 mare. She is a daughter of Lad's 50, a grandaughter of Cutter Bill and a Great grandaughter of Cutter Bill again, Buddy Dexter, Silver King. she also goes back to San Siemon. Whisper is a 5 yr old grade gaited mare. Tara and Leshia have done most of the riding on her so far.. she is making a great kids horse. Thank you Maw Maw Diane and Tom for letting us use Whisper.. Tara has been showing her .... She has been placing every weekend in Small Fry Poles and Small Fry Barrels.. Doing GREAT JOB !!! 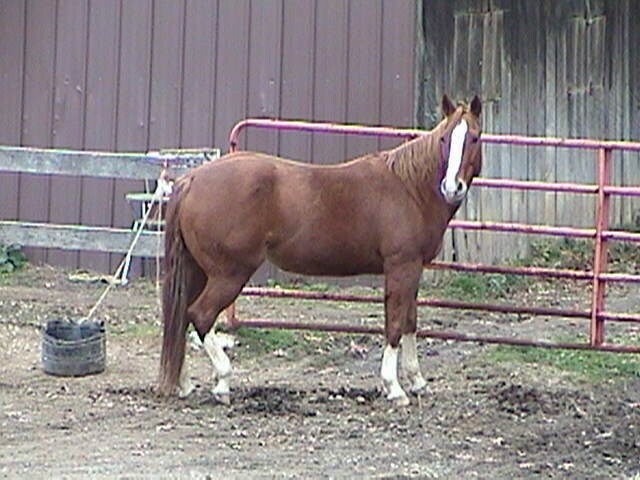 I raised this mare .. she is a 1995 APHA mare.. her bloodlines included Easy Jet, Three Chicks on top and Foundation lines on the bottom - Hollywood Gold, Poco Bueno, Cherry Dexter, Millie Roberson. She runs Barrels and Poles (for her size she can lay a nice Pole pattern down).. She also Team Penns.. she will do anything you ask of her..
She was shown in Showmanship, Barrel Racing and Pole Bending last year in 4-H and qualified to go to Ohio State Fair Jr. 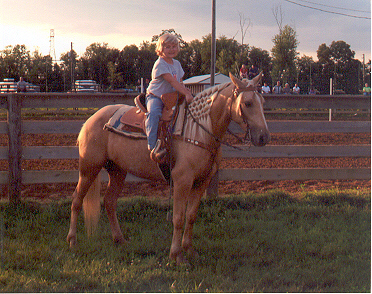 Horse show.. Leshia and Pepsi showed in Barrels and Pole Bending at the Ohio State Fair Jr. 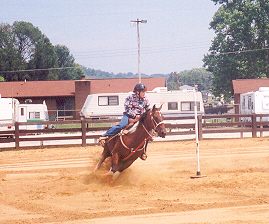 Horse Show in 2001. Did a GREAT JOB for their First year together.. she also runs at local show in our area..